Don’t be any means be deceived by this machine’s elegant looks. 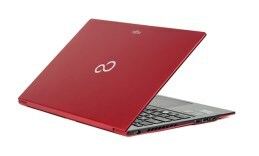 Its specifications with good reason earn it the right to be called an Ultrabook. It comes equipped with up to 3rd generation IntelCore i7 vPro Ivy Bridge processor. Our test sample featured IntelCore i5 with 3MB cache at the working frequency of 1.7GHz. This speed can be accelerated up to 2.6GHz thanks to Turbo Boost 2. The operating memory of this model can be 4 or 8GB. The graphic performance on this machine is delivered by HD Graphics 4000. When it comes to memory we can call this machine a hybrid as it combines 32GB of the fast-performing SSD with 320GB SATA drive. Its hardly noticeable display frame gives uniquely elegant looks to this business companion. In addition, the lightweight of only 1.4 kilos and thickness of only 15.6mm makes Fujitsu Lifebook U772 a great compact travel companion. It is so silm that I easily held it with one hand while browsing the Internet. The CyberLink YouCam webcam captures images and video in HD resolution. The LED display, which is LG’s work, has 14 inches and works in 1366×768 resolution and is perfectly adapted to outdoors use thanks to the anti-glare technology. The automatic settings tend to leave the screen a little dim but that is totally correctable by the brightness manual controls. The contrast is good and the sharpness draws attention to the details. The 4-cell Li-Ion battery provides extended battery life which helps you optimize the time you spend travelling, as it allows you to complete your tasks on the go. The battery drained completely after about 7 hours of constant playback and web browsing. Besides this, the ultrabook comes with a wide range of features that make it perfect for business trips and office work as well. This ultra mobile 3gen IntelCore machine is very reliable too thanks to the Advanced Theft Protection technology, fingerprint reader and Full Disk Encryption that protect your data against unauthorized access. The shock sensor protects all your important business data. The keyboard and touchpad provide quick and accurate controls. The big matte keyboard is island-style and is quite comfortable as the keys are well spaced-out. The Synaptics ClickPad below is perfectly responsive and supports multitouch gestures. The sound system on Lifebook U772 provided quite poor sound, so you will probably often use the 3.5 mm audio jack. The connection technologies on board include one USB port 2.0, SD card slot, HDMI and two more UBS ports but this time v 3.0. We were very pleased to find out that Fujitsu have provided a SIM card slot that supports 3G and 4GLTE. There is more good news, there is a docking connector as well. This business orientated machine combines attractive and elegant looks with reliability and power. It comes with Windows 7 Pro or the brand new Windows 8 Pro platform.